India is a big culture shock. 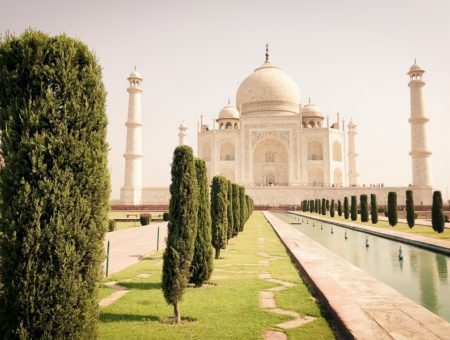 It may be hard to look past the overpopulation, traffic, and poverty when you first get here, but India does have some amazing architecture and natural sights, with famous landmarks like the Taj Mahal in Agra, and snow capped mountains in the Himalayas. The Golden Triangle of India is a popular tourist circuit that goes through Delhi, Agra and Jaipur. There are a lot of historical buildings in this area, but the main draw is the incredible white marble Taj Mahal. This famous world monument is a masterpiece and it should be on every traveler’s bucket list. Other worthwhile attractions in the Golden Triangle include Humayun’s Tomb in Delhi, and the Hawa Mahal in Jaipur. India is a relatively safe travel destination, with a low homicide rate of 3.2 per 100k inhabitants (48% lower than the global average). Still, sexual assaults are common in India, so women traveling alone may want to join a shared tour or other group if possible. Road safety can be an issue too, because the driving and traffic in India can be chaotic and dangerous; taking the train is a safer bet whenever it’s an option. India is a very budget friendly place to travel, with hostels available from $3 and private rooms starting from $6, but this is one place in Asia where you get what you pay for. Meals are also cheap, costing about $1 to $5 depending on location. Transportation in India is generally by tuk-tuk or car, but the train is better for long distance trips. Short distance trips can be done with the Uber transportation app.